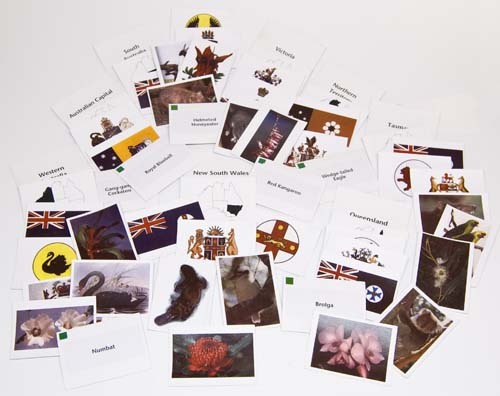 I made a set of cards (four sets actually, one for each Six) showing the emblems for each state and territory, with the relevant names on the back of each card, and the locations of the individual states on a map of Australia. You can make a set by downloading each of the templates in the adjacent menu, printing them and mounting the individual images on 50 x 70mm cards cut out of white pasteboard (available from any art store). I used these to play a game where Sixes would be given a certain amount of time to arrange all the cards under the relevant State heading. To help, I had posters of all the emblems around the hall so that all the required information was available—it was just much faster when the Cubs actually knew the answers. I also had all the Cubs make a set of cards for our state to help them learn this information for their Silver Boomerang test.